Since SageTV 7 was released to beta this year there have been several custom themes created to change the look of your SageTV user interface. Today we’ll take a look at each of the currently available themes and run through the basic steps for installing custom themes. Full UI Replacement and/or Add-on = Thes not only change the backgrounds and icons, but also change the way the user interface works and even modifies the layout. We’ll take a look at these in a future article. Custom Theme = A theme changes to appearance of the user interface. This can involve different backgrounds, different fonts, icons etc. The menus still work the same way and the layout remains the same. This is our focus today. In this article I’ll only show a few screen-shots to give you an idea of the theme. I’ll do a more in-depth look at each theme individually with screen-shot and demo videos in a later article. This isn’t really a custom theme. It’s the theme that comes bundled with SageTV7 and is what you see when you install SageTV 7. 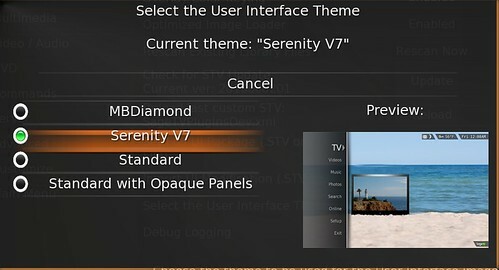 Keep in mind though that the standard UI could change a bit in SageTV 7 once it is released from beta. This theme is my favorite of the bunch and the one I use most of the time. The backgrounds are easy on the eyes, the highlight showing the focus of the menu is a bolder orange that makes it easy to see where you are in the guide or menu (a feature MrsGeekTonic really likes). This theme basically takes the standard SageTV theme and makes the panel backgrounds opaque. Not a big difference, but some users found the new semi-transparent panel backgrounds hard on the eyes so this plugin was developed to address those requests. 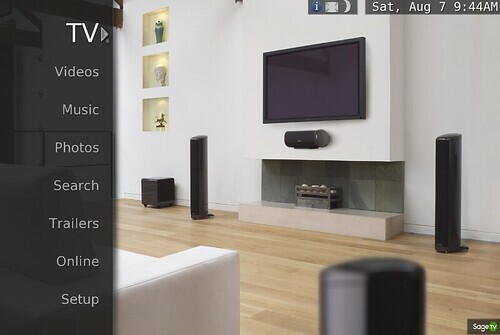 This one was just added to SageTV 7 this week and will be familiar to many long-time HTPC users. BlueTwo has been around older versions of SageTV, XBMC, Media Portal and others. This is a version updated for SageTV 7. 2. Adds the ability to remove items from the main menu which you do not use. 3. Adds the ability to rename any main menu items to a name of your liking. 4. The bar can be moved to the top,middle or bottom of the screen. The steps to download & install a new theme are fairly easy. 3. All available themes will be listed like you see in the screen-shot below. When you select any of the available themes, you’ll have the option to view plugin details including version history and you can also view any screenshots the plugin developer provided – right from the UI. 4. Select the theme you want to install by pressing the enter key on your remote control. 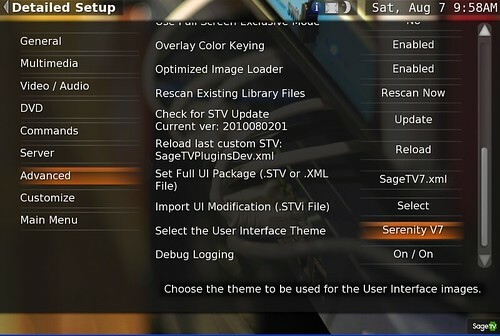 It will download from the SageTV.com server & then ask you if you want to load the new theme – select yes if you want the theme to load and replace the theme you have been using. 6. Once the new theme is installed (should take a less than a minute) you’ll see the changes to the background, icons etc. 3. Select the theme from the list (this will only show themes you’ve downloaded & installed from the Plugin Menu. That’s it. Again pretty simple. 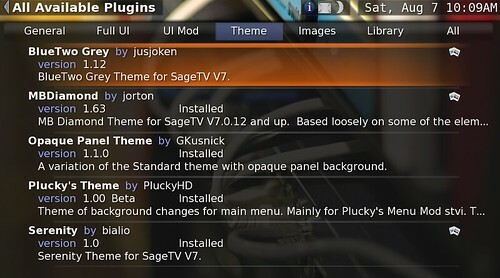 If you want to upgrade a theme that has been updated or uninstall a theme, head back to the Plugin Menu at: Setup>SageTV Plugins>Installed Plugins> page. Here you can update or uninstall any of your themes.